The Leo Triplett galaxies show up in this image by Alexander Jäger of the Interessengemeinschaft Astronomie. 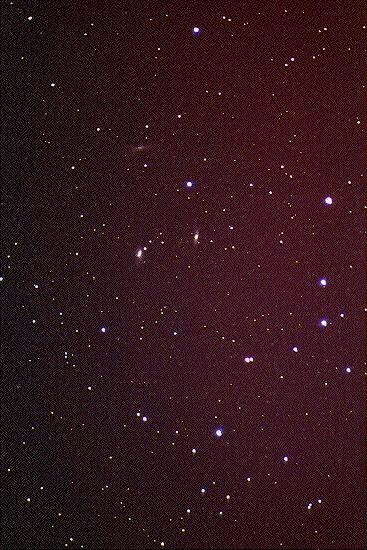 The three galaxies form a triangle about at the center of this image; M65 is on the most right (western, or preceding) galaxy, right abd slightly above M66, the brightest. Almost exactly above (north) of M66 is NGC 3628, the faintest of the three, a beautiful edge-on galaxy. This image was obtained on April 21, 1996, 22:46 UT, with a 600-mm f/5.6 telephoto lens, exposed 1 minute and 30 seconds on Kodak Ektachrome Panther P1600X, from Schwarzenberg-Bödele, Austria.